THIS PIECE WAS ORIGINALLY PUBLISHED AT TAOSTYLE.NET, LYNNE ROBINSON’S FABULOUS BLOG ABOUT WHAT’S HAPPENING UP HERE AT 7200 FEET. SEE THE ORIGINAL STORY AND CHECK OUT TAOSTYLE HERE. A need (or problem), encourages creative efforts to meet the need or solve the problem, as Plato noted in his Socratic dialogue, The Republic. When Susan Dilger and her husband arrived in Taos for the first time in 2003 (at the invitation of friends from Santa Fe) the Taos Talking Pictures Festival was in high gear back then, and a low-key look around the sleepy town – the antithesis of Los Angeles, their home at the time – had them falling in love at first sight. Her husband was employed by the City of Los Angeles, and Susan’s high powered career as an executive at the May Company kept them in California a while longer. Susan spent almost 30 years in retail, a career that took her from Washington, D.C. to New York City to Los Angeles. She worked in every aspect of the industry. “Buying, finance, operations, marketing – you name it, I did it.” She laughs. After the company was bought out in a merger and once her husband retired, the Dilgers moved at last to Taos, where Susan intended to pursue her love of jewelry-making, a craft she’d picked up a few years prior. But friendships she soon forged with local artists Dan Enger and Chipper Thompson, gave her the idea to promote their work through an online store. With Enger and Thompson on board, as well as Amy Córdova, she began putting together high-quality T-shirts featuring their artwork. The focus was on artwork that was “cool and edgy,” says Susan. 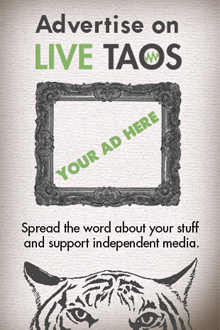 Taos Edge made the t-shirts available to a broader audience. Along with the t-shirts she continued making jewelry and had it placed in several outlets including the Harwood Museum gift shop. Befriending musicians like Chipper Thompson, soon led Susan down another rabbit hole. 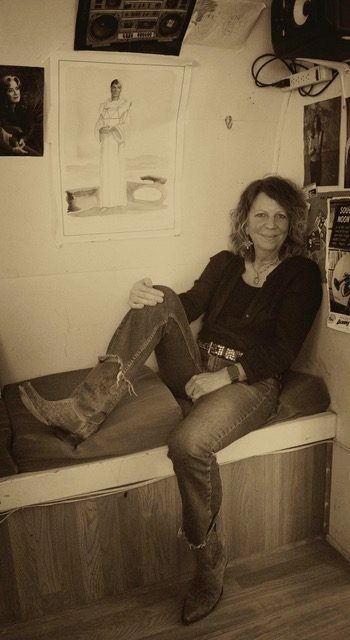 “It was a combination of working with artists like Chipper and going to Michael Hearne’s Barn Dance where I caught the Americana bug.” She remembers. Soon she was making merchandise for bands and her jewelry was on the back burner. A chance meeting with Nancy Stapp had the longtime, popular local Radio talk show host, inviting Susa to co-host her show once a week, and Susan found herself falling in love again. This time with Radio. Fast forward a few years and we are having coffee at the World Cup Cafe. 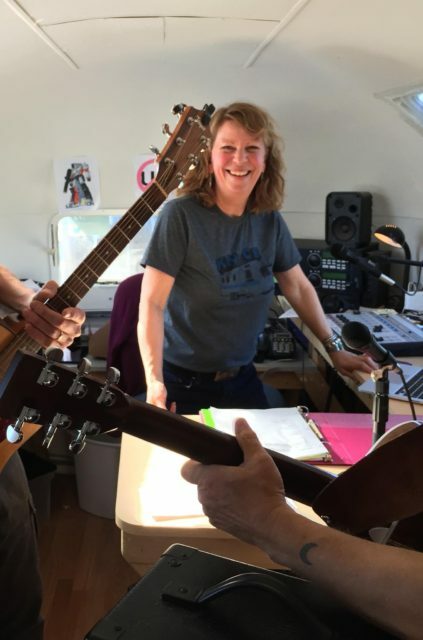 Every Sunday night at Taos Mesa Brewing’s Mothership, the floor is cleared for dance lessons at 6 p.m. and then a live band takes the stage from 7 to 9 p.m.
“Everybody is welcome,” says Susan who also serves as an emcee for the two-stepping dances. “It’s amazing exercise and great fun!” She says. On Saturdays from 11am – 2pm, Susan hosts her very popular show on KNCE. Featuring the best of Americana from the Southwest and beyond. 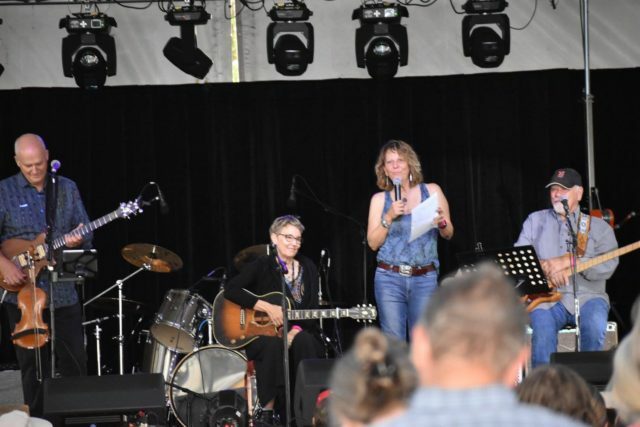 Susan often features local musicians in-studio and shares upcoming live music events from around town and the region. The show is streamed live online and her audience is international. When we met, she had already gone to SXSW in Austin in March and was planning her second trip to Nashville’s Americana Fest in September. These events are now part of her annual agenda. 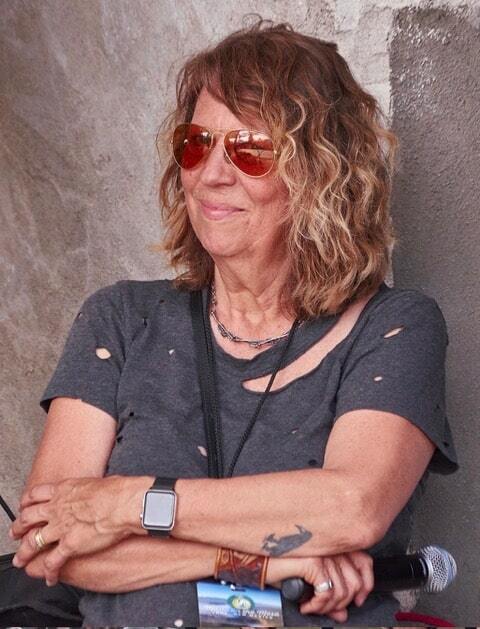 Looking at Susan now, casually dressed in a t-shirt, jeans and trendy silver Birkenstocks, her highlighted curly honey mane falling around her shoulders, it’s virtually impossible to imagine her as she must have looked in her past life as an executive, so comfortable does she seem in her edgy new skin. Her personal reinvention has been nothing less than a total transformation. These days she sees herself as an “informal conduit” for musicians who want to visit and play in Taos. When she and her husband want to get away from it all nowadays, they take off for a weekend camping in the wilderness, in their spiffy newly renovated vintage trailer. 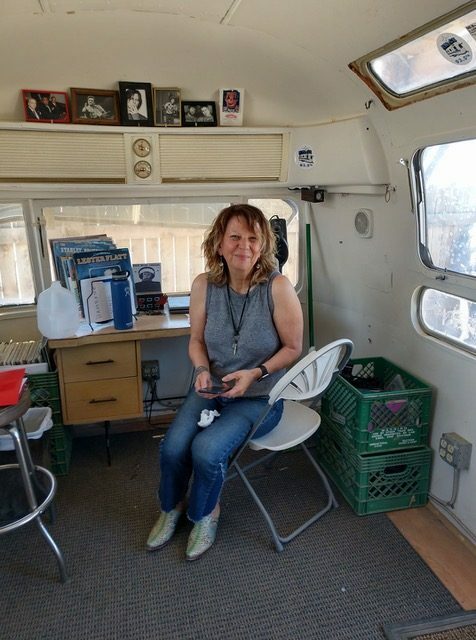 Whether due to necessity or not, Susan came to Taos in her imagined retirement, and invented a new life for herself. Remarkable women are not an anomaly here, neither are women who completely reinvent themselves upon arrival. Perhaps it has something to do with the altitude or the Frontier vibe – we are in many ways still Outlaw Country up here in the Wild, Wild West – but the extraordinary women who arrive in Taos decade after decade, continue to inform and inspire both the way we see ourselves and the way the world sees us. Susan Dilger is one more link in this ever-growing chain. For more about Susan’s show at KNCE and Sunday Nights at the Mothership, please visit the sites linked below. Photo credits: James Robins (top photo) Cathy McKinley (sitting in studio) Doug Yeager (sepia print), others, unknown.